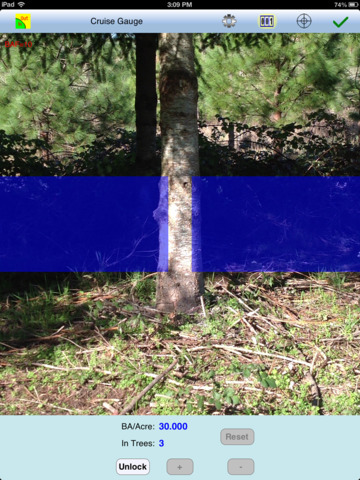 The Cruise Angle iCMT app can turn your iPad, iPod or iPhone into an angle gauge for selecting sample trees for timber cruising. When using the point sampling method for timber inventory, the forester first determines a suitable Basal Area Factor (BAF) for the timber stand. Then the corresponding angle gauge is used to select the sample trees. At each sampling point, the forester scans the trees through the opening of the angle gauge. Any tree that completely fills the opening is deemed a sample tree. From the tally of sample trees, one can obtain the basal area per acre. Instead of bringing along a few angle gauges, you could just as well use the Cruise Angle iCMT app on your iOS mobile device to pick the sample trees. * Work with Metric and English measurement units. * Calibrate the gauge or enter the camera FOV angle value. * Change the color and transparency of the on-screen angle gauge. * Select from a list of the commonly used BAF values. * Tally the sample trees for a point. * View the Basal Area per Acre for a point. * Check borderline trees based on limiting distance calculation. * Calculate the actual stem length of a leaning tree. * Convert between horizontal distance and slope distance. * Measure distances on the displayed Map. * Measure an area on the displayed Map. The Node tool provided by Cruise Angle iCMT will let you drop nodes precisely to delineate a line or an area to view the measurement value. You could also add your GPS location as a node. Please note: Location data depends on the GPS receiver used. Continued use of GPS running in the background can dramatically decrease battery life. The app will let you easily toggle the built-in GPS on or off. This app comes with a built-in help file. Fixed iOS 8 compatibility issue. © 2013 Corvallis Microtechnology, Inc. SLOTS FAVORITES: FREE Las Vegas Casino Slot Machines Game - New for 2015!